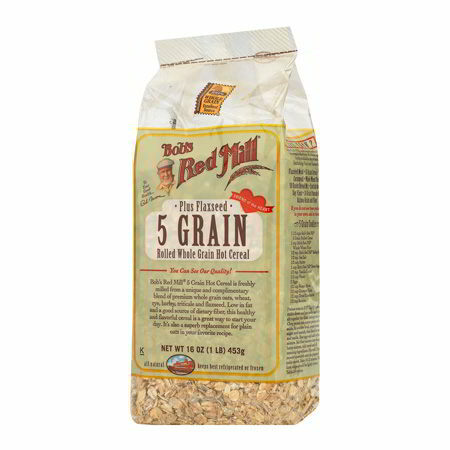 5 Grain Rolled Cereal is freshly milled from a unique and complementary blend of premium whole grain oats, whole wheat, rye, barley, triticale and flaxseed. It is just like oatmeal, only better! Low in fat and a good source of dietary fiber, this healthy and flavorful cereal is a great way to start your day. Rolled oats are rich in protein, vitamins and minerals. In addition to its nutrients, oats contain significant dietary fiber, an indigestible type of carbohydrate that improves your digestion and lowers your risk of obesity and cardiovascular disease. Whole wheat is a good source of fiber as well as calcium, iron, phosphorus and other minerals, and contains several vitamins, including folate and riboflavin. Among the nutrients in whole wheat are the B vitamins which collectively support your metabolism to help your body derive energy from your food. Rye contains fiber, protein, potassium, calcium, iron, phosphorus, magnesium, manganese, vitamin B-1, folic acid, thiamin, niacin and antioxidants. These nutrients help lower cholesterol along with the risk of cardiovascular disease, cancer and diabetes. Barley is high in dietary fiber and is also a mineral-rich food. Barley is also an excellent source of carbohydrates, which are the body's primary fuel source, and a good source of protein, needed to build and maintain the structure of cells and tissues. Triticale is a hybrid crop with the quality of wheat and the hardiness of rye. It’s packed with dietary fiber and potassium and is low in sodium. Flaxseed is the most widely available botanical source of omega-3 fatty acids. It’s also an excellent source of calcium and fiber; and is one of the best sources of lignans, which act as antioxidants. Try mixing this cereal with milk and yogurt and let it sit in the refrigerator overnight for “Cold Oats.” It’s also wonderful taken right from the bag and sprinkled over Greek yogurt with fresh fruit for breakfast, or use it to make delicious healthy granola bars for the whole family. For a divine breakfast treat, cook it up hot, add a bit of dark cocoa and cinnamon, and top it off with a dollop of peanut butter. This cereal is also great added to homemade bread, making quite a difference in taste, crumb and texture. It’s also a superb replacement for plain oats in your favorite recipes. Make your favorite oatmeal cookie recipe using our 5 Grain Cereal for a delectable treat. Whole Grain Hard Red Wheat, Whole Grain Rye, Whole Grain Barley, Whole Grain Oats, Whole Grain Triticale (wheat) and Flaxseed. *Manufactured in a facility that also uses soy, wheat, and milk.